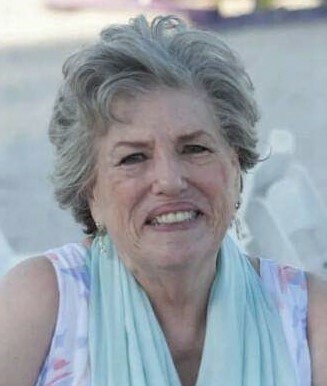 Elva "Bonnie" L Sims, 87 passed away peacefully at Riverwalk Village in Noblesville, IN on April 8, 2019 after a long struggle with Dementia/Alzheimer's. Bonnie was born as Elva Lavonne Voris on September 21, 1931in Greenwood, In to the late Roy and Marcella (Parkhurst) Voris. Bonnie, with older sister Deloice(Dee) and younger brother Richard were born in the midst of the great depression. Their childhood was typical of the period, and they had many extended family and friends helping each other get through those rough years. Bonnie & Dee enjoyed singing songs they had heard on the radio, harmonizing together as they did the dishes. It was said that anyone who heard them sing thought they should audition to get on The Grand Ole Opry Show. As the post World War II era ushered in the beginning of the "golden age," in the late 1940's, Bonnie's parents rented out the 2nd story of their home to two brothers, who came to Greenwood from Kentucky, to learn the machine tool and die from an uncle. It was kismet that the two sisters, who were in high school, began to double date the two handsome boarders. Bonnie was drawn to Kenny, the oldest brother, and in due time he proposed to her and she accepted. As Kenny's career prospered, he became a pilot and purchased a plane. he took to the skies with Bonnie, doing loops and barrel rolls, just to hear her scream with delight and in fear. Kenny's fearless flying did not scare her away from him. When they finally married onn August 15, 1950 she convinced him to sell the plane; or was it, the marriage was contingent on selling the plane? Either way, he built her a new home in a Greenwood suburb and together they began to raise a family. In 1960, Kenny took a job at a machine shop near Elwood. He bought a small farm and moved the family to Elwood, INdiana. Bonnie, far from her mother and father and family, was pregnant with her 5th child, and had to make the best of it. She turned a drafty old farm house into a warm and loving home for the family. She excelled at homemaking; not only raising 5 children, she was also a nursemaid to cats, dogs, pigs, chickens, ponies, horses and even a monkey named Kelly. She loved gardening, bowling, ceramics and oil painting. She continued to sing at home and eventually became a cantor at St. Joseph Catholic Church for many years. The old house, remodeled in the mid 70's, made room for a growing number of grandchildren to come to her open arms. Every year, Easter egg hunts, fireworks and Christmas presents would bring all of her grandchildren together, along with their parents, to the farm to celebrate the holiday with "Mommaw" and Papaw." Cancer claimed the love of her life Kenny on August 13, 1995. Her son Keith then moved in with her to take over the upkeep of the house and property. Gradually, the huge holiday celebrations moved to the homes of her children. The new century brought to Bonnie's loving arms great-grandchildren. By 2015 subtle hints of memory issues began to affect her and slowly Keith and his sisters began to take over her responsibilities and personal care as the dementia began to take a heavier toll on her. However, dementia was no match to Bonnie's ability to dote on a new batch of great-grandchildren that began to arrive after 2000, including her newest addition to the family just last year. Though her mind was mixed up between fact, fiction and the time periods of her life, up until the end she was able to name each of us and knew who we were to her. That made her decline a bit easier. Now she is reunited with her loved ones who passed before her. She has earned her wings in Heaven. Bonnie was preceded in death by her parents, her husband, her brother Richard Voris, her daughter Kemela Hicks,her son Justin(Keith)Sims and her infant grandson David Stigall. She is survived by daughter, Vicky Ryan of Elwood, IN, daughter, Sherry Pace of Noblesville, IN, daughter, Terry Stigall of Bloomington, IN., and her sister Deloice Fulk of Greenwood, IN. 9 grandchildren and 6 great-grandchildren. Funeral mass will be celebrated at St. Joseph Catholic Church on Saturday, April 13, 2019, at 11:00a.m. with Father Dan Duff officiating. Burial will follow in the St.Joseph Catholic Cemetery. Visitation for family & friends will be on Friday, April 12, 2019 from 4:00-8:00p.m. at Dunnichay Funeral Home, 1113 South Anderson Street, Elwood, IN. The rosary will be recited at 8:00 p.m. In lieu of flowers memorial contributions may be made through the funeral home to St. Joseph Catholic Church Building Fund.